You didn’t think I’d leave you in the dark, did you? You didn’t possibly think that after waxing poetic on my impending encounter with acclaimed Alsatian Michelin-starred Chef Bruno Sohn, I’d recede into selfish silence and solitude? No, dear readers, I owe you a detailed chronicle of Monday night’s culinary affairs. In the interest of completeness, integrity, and the honor due unto sumptuous fare, here is my end of the bargain. It was a full house at Le Gray’s 6th floor stately restaurant, Indigo on the Roof, and as we settled into a round table, our notice was immediately drawn to the St. George Maronite Church bell tower, illuminated for the first time since its completion last week. Nestled next to it, in the tapestry-like character endemic to Lebanon, Al Amin mosque, resplendent with its turquoise domes. Now that I’ve painted the scene, let’s dive into the edibles. 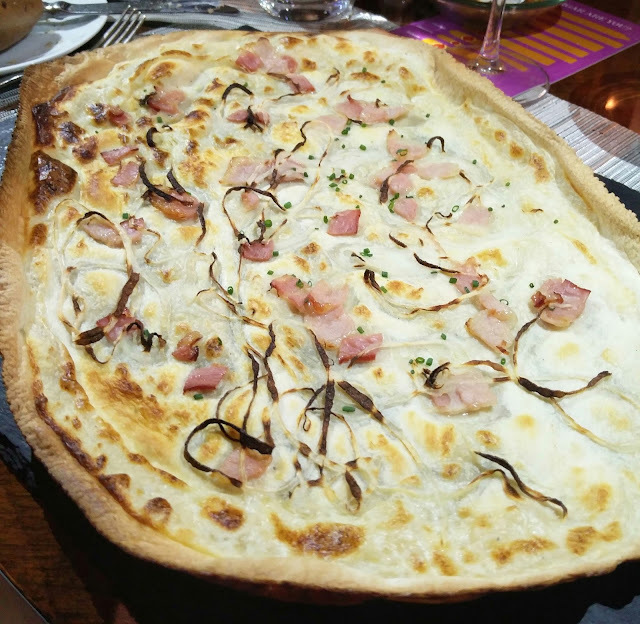 For entrée, the tarte flambée (22,000 LL) had been haunting me all weekend, as I conjured up images of a supple quiche in my head. But what actually panned out, literally, was a paper-thin crispy flatbread – think matzo – lightly blanketed with onions, bacon, and a white cheese typical of Alsace. Also on the menu was Chef Bruno’s homemade foie gras terrine accompanied by quince chutney and toasted bread (36,000 LL). 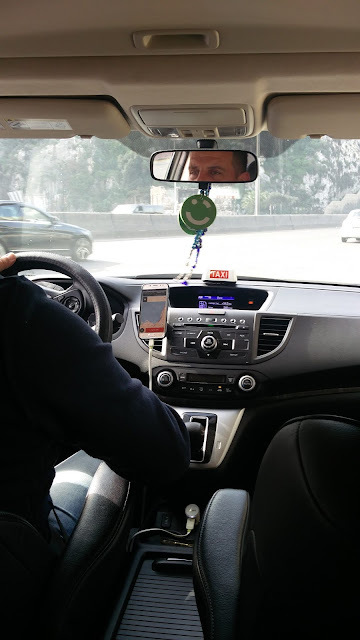 I had a lick of the duo—just about my tolerance for the gamey spread—but was pleasantly surprised by how subdued it in fact was. For the first time I found myself divided over all the main dishes on offer, and there were seven to boot! After much debate, I homed in on the grain-fed Black Angus filet (70,000 LL). I mean, how often do you see good old steak on a fancy menu? Usually you’re bombarded with alien objects that sound better on paper than they appear in real life. 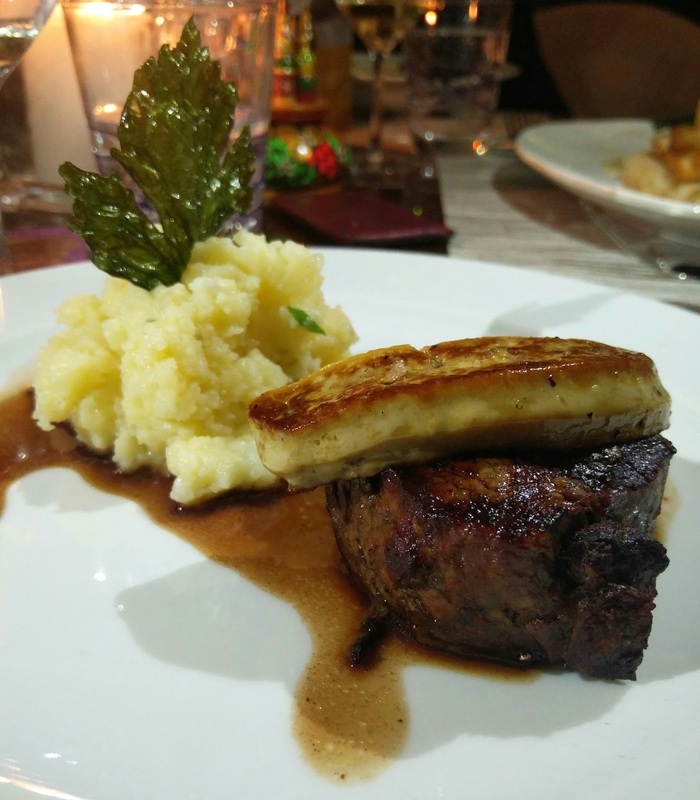 The fact that the boeuf rôtie came topped with pan-seared foie gras was of little consequence, and as I sliced through the tower of tenderloin and duck, I was astonished by how much more delightful the latter is in its cooked form. Nothing short of an epiphany. The mountain of mashed potatoes with beef jus sealed the deal. 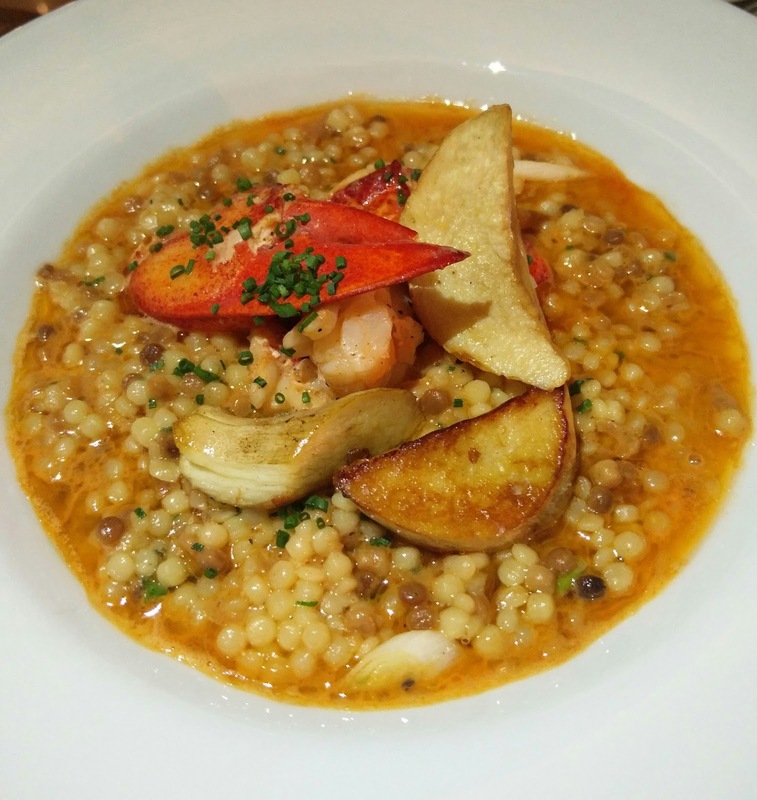 My second choice would have been the lobster fregola risotto, and the hubby good-naturedly complied with his order. Fregola is a Sardinian pasta that very much resembles our moghrabieh – imagine giant couscous. Cooked in a lobster bisque and swimming with succulent chunks of the crustacean, this dish was homey and hearty all at once. I spooned in a couple mouthfuls between slices of the steak. Dessert is where things got wild, and by wild, I mean revolutionary. Alsace is renowned for a bundt-style cake called the kougelhof (also spelled gugelhupf and kugelhopf) molded into a distinctive ring shape or torus. 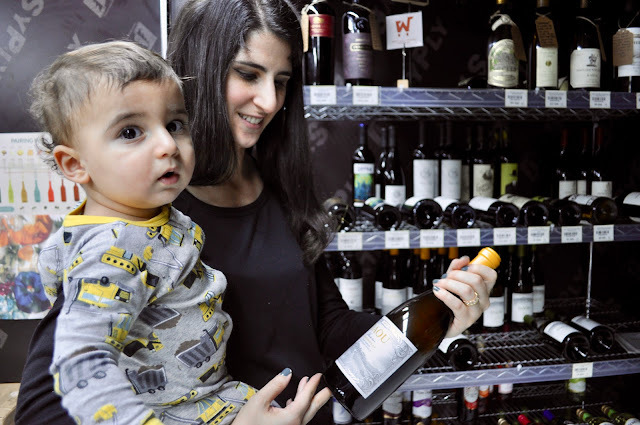 It’s usually imbued with raisins, almonds and Kirschwasser cherry brandy. 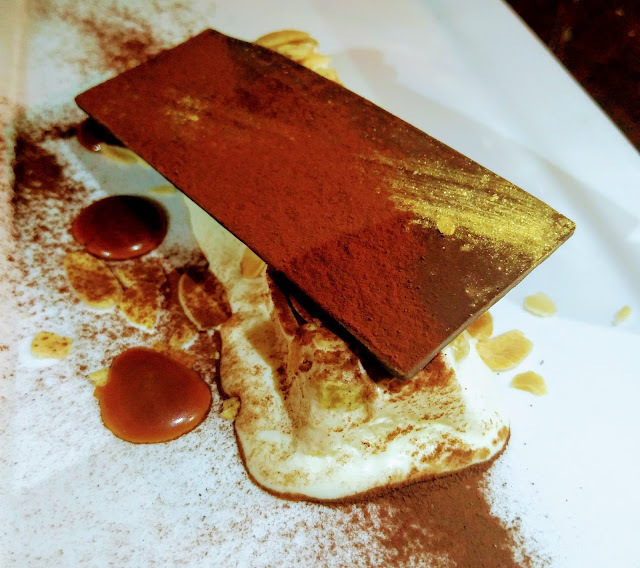 Chef Bruno developed an ice cream rendition of the kougelhof with a nutmeg raising salad, orange blossom, and a tablet of dark chocolate (18,000 LL). This one you won’t want to share. 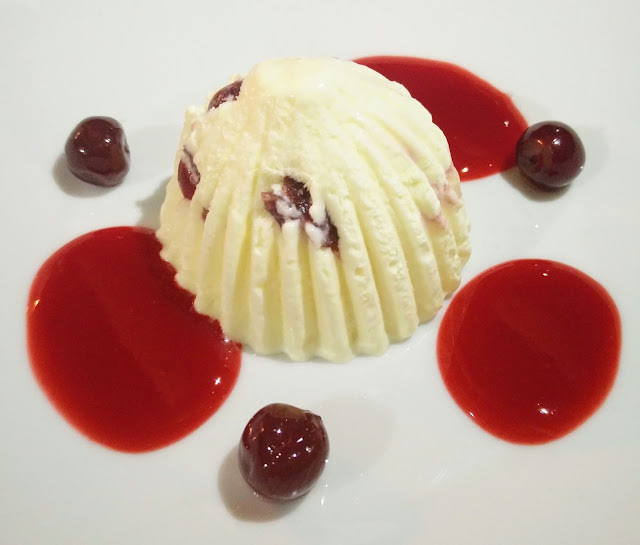 The soufflé glacé is another ice cream extraordinaire laced with kirsch and Morello cherries (18,000 LL). 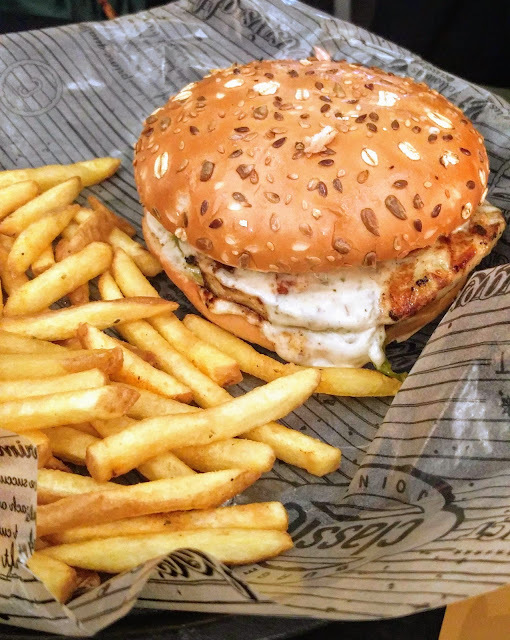 It’s light and ethereal and fills the role of digestive beautifully. 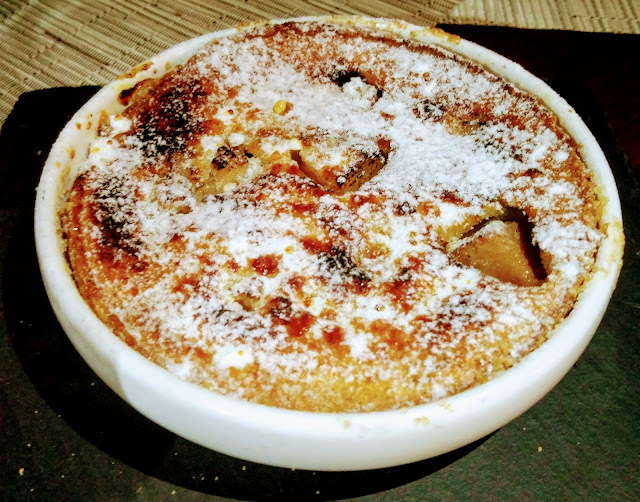 For a taste of autumn and home in one, the clafoutis aux poires (18,000 LL) comes in an individual-sized pan festooned with a dollop of vanilla ice cream. This is the pizookie for gourmets – it’s simple yet elegant. 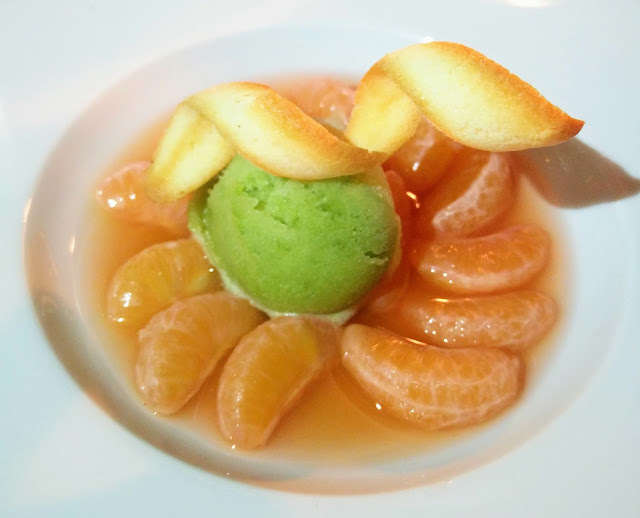 Produce lovers will take heart in the mandarin and quince soup balanced by a scoop of basil sorbet. A savory ice cream, you say? Believe it or not, it’s far from off-putting, but I’d be keen on trying a minty edition. 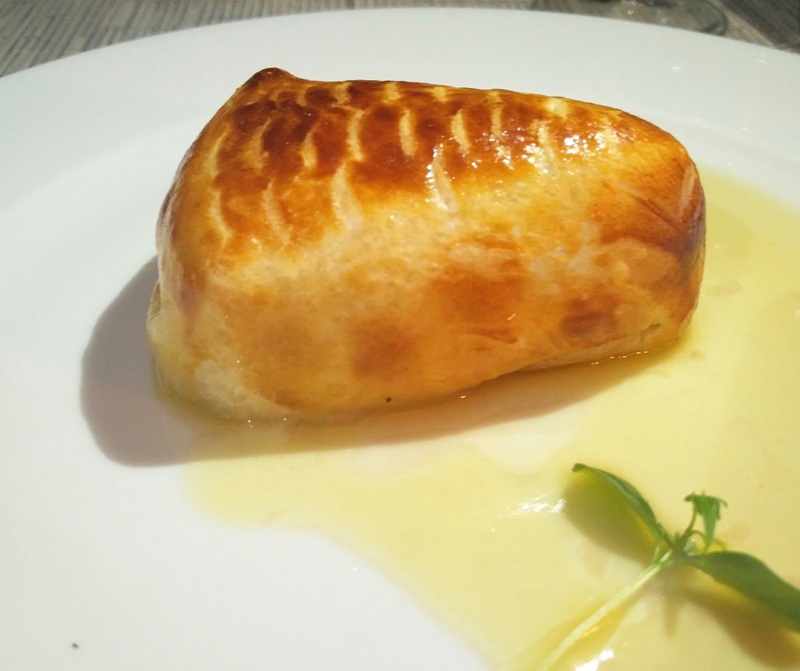 French cuisine generally bins cheese with dessert, which is why you’ll find a feuilleté triangle oozing with sharp Munster cheese (20,000 LL). One bite of this earthy creation, and you’ll be pining for a reprise of the foregoing desserts. So if you're bent on ordering it, be sure to follow with something saccharin. A proper French meal is not complete without mignardises and coffee (or tea). 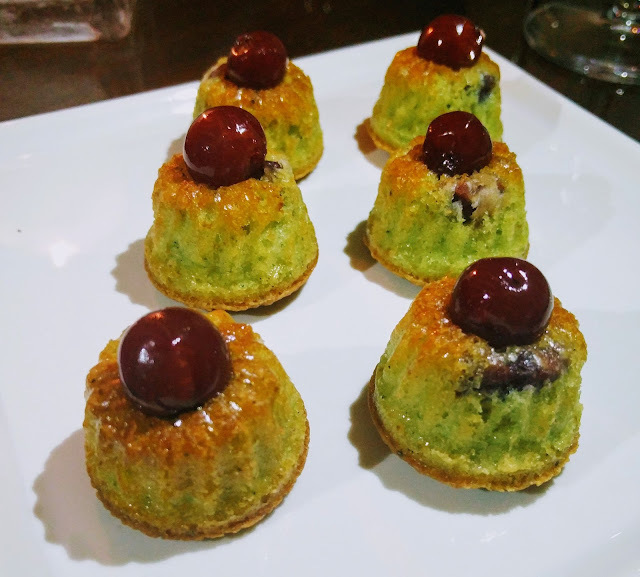 The delight of the night were miniature kougelhofs innovated by Vanessa Dawe, a close friend and associate of Chef Bruno who graced us with her hospitality savoir-faire. Emblematic of Alsace, her dainty délices Les Kaprices are designed to compete with the overdone macaron and cannelais bordelais and can actually be purchased in savory or sweet form through an online boutique. 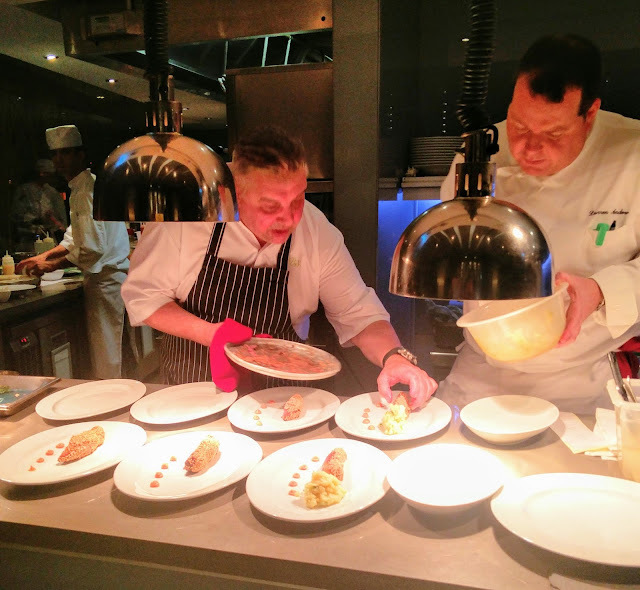 Perhaps the most memorable episode from the evening was admiring Chef Bruno hard at work in the kitchen, meticulously preparing each plate with the adept assistance of Indigo’s Executive Chef Darren Andow. The two worked harmoniously to pull off an incredible service for 74 earnest diners, and their synergy was unmistakable. If a meal prepared by a Michelin-starred chef makes its home on your bucket list, I cannot recommend enough Chef Bruno’s marvels at Indigo. Catch him before he skips town to Strasbourg next week.